There are not many shore dives on the North Coast of New South Wales. This is mainly because there is virtually no reef adjacent to the shore. In most cases, the reef drops to sand only a few metres off the shore. South West Rocks is well known for Fish Rock. This is a fantastic dive location, with a large number of separate dives, including the famous Fish Rock Cave. 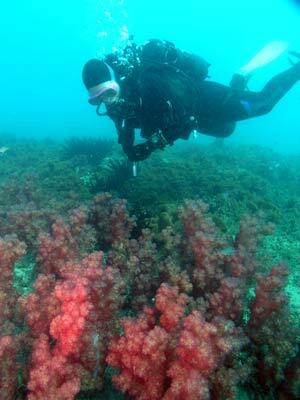 There are a couple of shore dives that you can do at South West Rocks. One is Bait Reef off Trial Bay Gaol, another the Macleay River Drift and a third is Back Creek. The only other decent shore dive is called Ladies Reef. Ladies Reef is located straight off the main headland in front of South West Rocks township. This location is perfect in southerly winds and seas as it is totally protected from these conditions. To do this dive, you can park in the carpark next to the South West Rocks Surf Club or the car park on the headland (this is the one to the east of Horseshore Bay). Once you have geared up, walk to the beach immediately to the east of the headland. This is a small beach between the headland and the large boulders. It is called Main Beach but this name also applies to the beach to the east of the boulders. As long as the waves are not too large on this beach, you can dive this site. Walk into the water and done your mask and fins. Swim out on the surface to Stingray Rock. This is the rock about 110 metres off the beach. Once you get here, descend and swim around the reef till you get to the northern-most part of this reef. As you go, you will see that there is some very prolific fishlife here. Large schools of bream, yellowtail, silver sweep and trevally cover the reef. You will also see lots of luderick and many tiny baby red morwong. Between the main section of the reef and the northern section you will probably see a huge bullray that gives its name to this rock. It is about five to six metres deep here, depending on the tide. Once you get to the northern end, head off due north. It is about 100 metres to Ladies Reef. This will take about four minutes. As you go, you will see some ropes sticking out of the sand. These appear to be in a direct line to the reef. 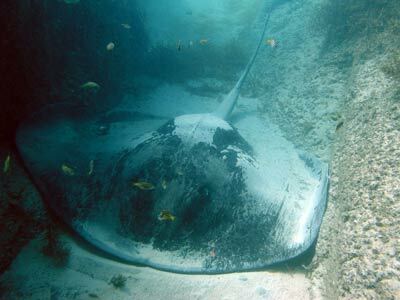 As you go, look out for shovel-nosed rays on the sand. If there are a few of you diving together, fan out in a line so that you cover more ground and can find the reef easily. The depth will increase to about 10 metres. Ladies Reef is not big, it is about 30 metres north to south and about 10 metres east to west. It only rises up a maximum of two metres from the sand in the middle. The maximum depth around the reef is about 11 metres. Once on the reef, head around the reef in one direction. Straight away you will see soft corals and hard corals. Examine everything closely as there is a lot of macro life on this reef. 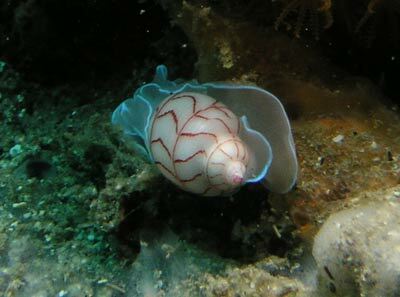 Look for nudibranchs and shellfish. On this dive I have seen the tiniest of red morwong, only 30 mm long, a yellow boxfish about 3 mm long as well as other juvenile fish. Look carefully and you will also see decorator crabs. 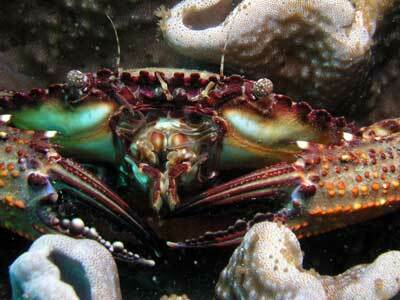 As you swim around the reef, look for crabs. 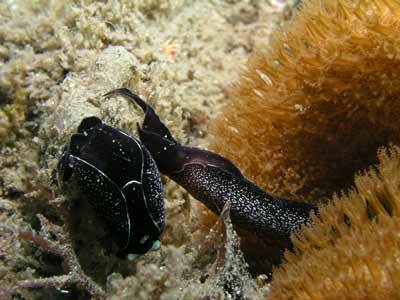 These are quite large and can be found inside some of the sponges. 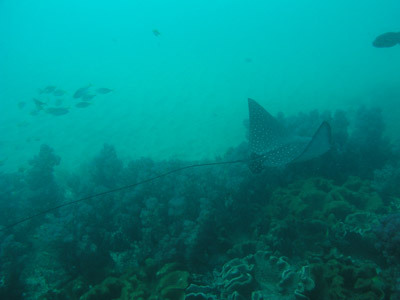 Keep an eye out for the resident eagle rays (with the longest tails I have ever seen) as well as other fish like large flathead, bream and trevally. Once you have done one circuit, try doing one a few metres off the edge and then finally right down the middle. This is not a big site, but there is a huge amount of life to see. Once you have finished, head south from the southern end till you hit Stingray Rock. G go around this reef (on the others side to that you saw on the way out) and head south again till you get back to the beach. This is a surprisingly good dive, and would be an excellent night dive. Try and do it if you get a chance, especially if your boat dives are blown out.